A modular easy to install walkway system designed to the requirements of EN 516:2006. Kee® Walk provides a safe, anti-slip, level walking surface for anyone who needs to access a roof in the course of their work. It provides a clear demarcation route which protects the roof surface from unnecessary damage and uniformly distributes the pedestrian load across its surface. Kee® Walk is designed for modern roof types including membrane, profiled and standing seam metal roofs. As it features adjustable brackets, delivered to site pre-assembled it can be used on flat, barrel and sloping roofs, with steps, longitudinal and traverse options allowing access to be created for virtually any roof configuration from 0 to 35 degrees. The product complies with the test requirements of EN 516:2006. Due to it being adjustable and using simple standard roof fixings or non-penerative clamps or weights this reduces the need for on-site measurements or specially made parts, saving time and money on installation. 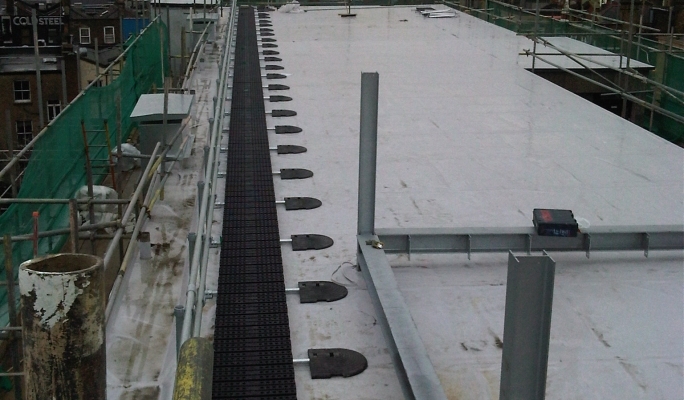 Kee® Walk is offered in standard modules, which can be supplied ex-stock for rapid installation on virtually any rooftop project. The modules are supplied as 5 foot (1.5m) and 10 foot (3m) pre-assembled sections to suit the requirements of different roofs. These lightweight modules are constructed from glass reinforced nylon treads attached to aluminum support beams that are fixed to the roof surface. Steps and a traverse option, complete with an adjustable hinge, enable Kee® Walk installation to be added to roof configurations from 0 to 35 degrees. The installer can easily set the angle of the steps, by removing the locating bolt in the hinge, adjusting the angle and replacing the bolt at the desired point on the hinge. No custom made parts are required. 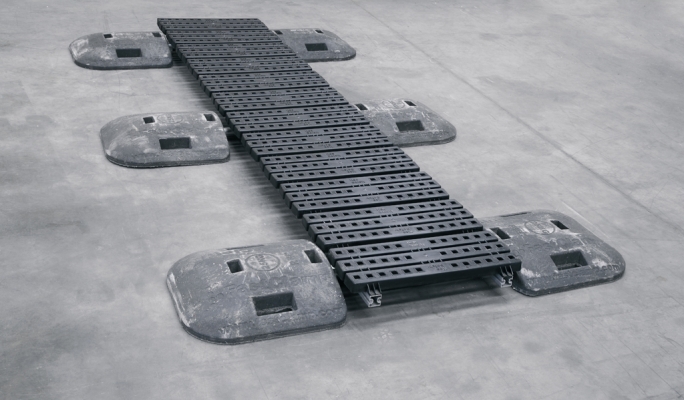 Kee® Walk treads are moulded from tough glass re-inforced nylon and can be returned to Kee Safety at the end of the systems life for recycling all other components are ferrous metals or aluminum alloy and can be recycled at any metal recycling facilty. 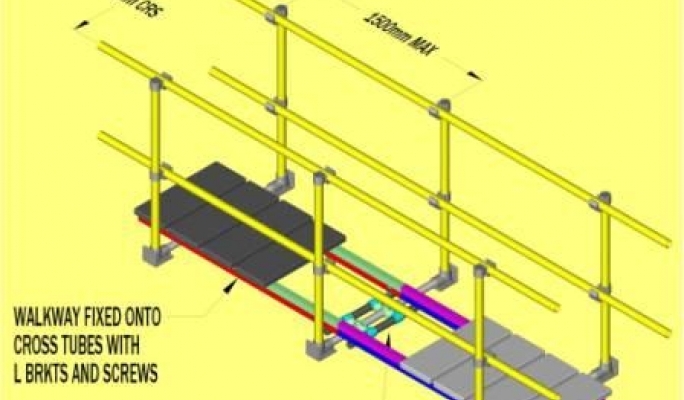 The Kee® Walk system is fully compatible with all horizontal safety line systems including Kee Safety's KeeLine® system or can be used on flat roofs with the KeeGuard® system to produce free standing walkways. Kee Walk®is available for flat membrane roofs in a non-penerative solution that uses extra weight to resist wind up lift. 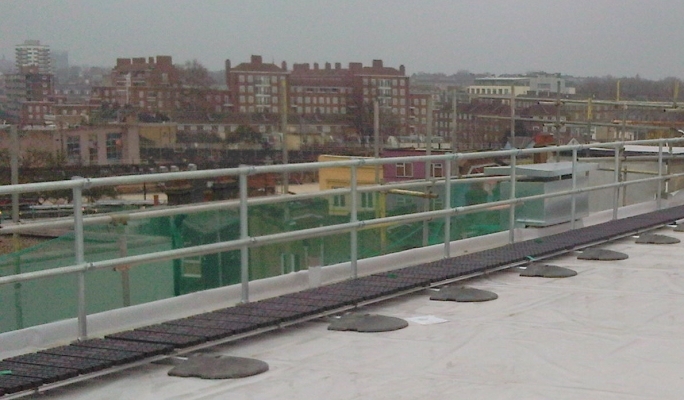 It can also be teamed with the KeeGuard®system to produce a roof walkway with the option of guardrail on a single side or both.